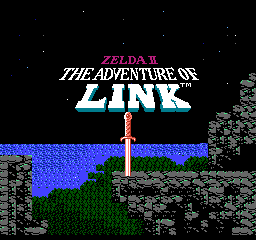 Zelda II: The Adventure of Link is commonly considered a black sheep of the Zelda series, due to it being a full sidescroller, featuring many RPG-style elements, and having a greatly increased difficulty by comparison with the rest of the series. Nevertheless, it turned out to be a very successful game. There's an unused graveyard side-scrolling area if you use an overworld walk-through-walls code to get into a battle on a mountain tile, which isn't normally possible. This area looks like a plain grotto, with no relief. Its data is located at 0x4EDC. This area was most likely meant to contain an item, judging by its structure. It appears you were supposed to enter it by falling through the shaft on the right. The black part on the left is actually made of individual breakable blocks, like the ones in the palaces. Every area in the game has data for fully functional breakable blocks, but West and East Hyrule don't have any graphics associated with these; if you fell in this room without the Handy Glove, you would be stuck. Its data is located at 0x4F1C. Every palace has unique graphics for windows, but the fourth (Maze Palace) and sixth (Hidden Palace) palaces don't actually have any windows, rendering their window graphics ordinarily unused. It is still possible to see them through a glitch involving the Fairy spell which makes the game load Parapa Palace's layout with the graphics of another palace. Spikes exist for every palace. 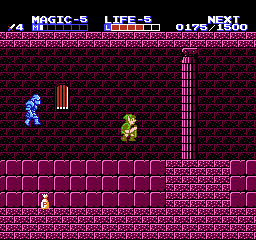 Zelda II has a bunch of hazards, but spikes are not among them. Unused "broken wall" tiles which were never adapted to the added palace graphics of the American release. Unsure what this was meant to be for. Check which revisions the 3DS VC versions use, and have a look at the Japanese GBA version. Zelda II was re-released for the GameCube in 2003, the Game Boy Advance in 2004, the Wii Virtual Console in 2007, and the 3DS Virtual Console in 2012, some with a few minor changes. Though the American/European/Australian Wii release is straight from the NES version, the Japanese Wii release seems to be based on the Japanese GBA version, so it features some parts of the disk and cartridge plus things like the new 2003 script. Like with the first game, the American 3DS release seems to be based on the original NES version. The American Wii U release also reverts to the original, despite the Wii U version of the first game maintaining the 2003 changes. The new GCN and GBA versions tried to fix up the grammar again, though being based on the NES version, there's still no mention of the different Zeldas; the copyright date was updated as well, of course. As previously mentioned, the American/European/Australian Wii release is pretty much the NES release, while the Japanese Wii release seems to be derived from the previous Japanese GBA version. When losing a life in the FDS and NES versions, the screen flashes rapidly with a rainbow of colors, potentially causing seizures. In the updated versions, the screen just flashes between similar shades of red. 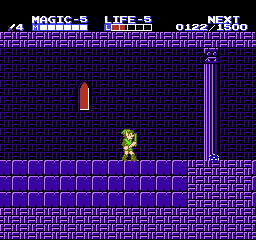 The 3DS Japanese Virtual Console release of Zelda II has some unused 2A03 code written in comments in "linkA.tds.patch" that relate to the changes made to adapt to the Virtual Console's automatic swapping of FDS game disk sides when necessary. 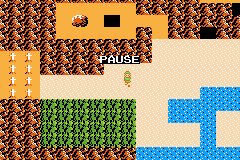 The 2003 version added a black "PAUSE" box, nowhere to be found in the original FDS and NES versions. The PAUSE text in the GBA version. This page was last modified on 19 April 2019, at 03:09.